Timoney’s new Independent Suspension Combo, designed to offer the best of all worlds, is launched at IDEX 2019. The system is a fusion of Timoney’s renowned and widely adopted Independent Suspension (IS) and rugged, volume produced drive systems, all developed for the harshest regimes with a unique supply model that offers maximum mobility at lowest cost. The system addresses 4×4, 6×6 and 8×8 requirements with several axle ratings up to 16,000kg depending on activity and operational requirements. The concept involves separate qualified supply channels for the suspension system and primary drive solutions which can be procured in component form as opposed to fully assembled drive axles. As well as system cost benefits, the solution also provides significant advantages for shipping and logistics. Timoney will roll out the Combo approach for a range of other Axle ratings in the future. 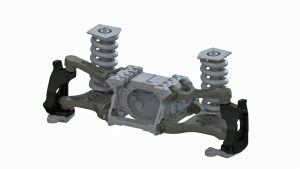 “Our aim is to take our Independent Suspension technology to as broad a customer base as possible through this unique supply model” said Timoney CEO, Shane O’Neill. “By adapting our best in class IS solutions to proven, rugged and reliable drive aggregates that are produced in volume for tangential markets such as the construction and crane industries we are able to offer our customers exceptional performance, reliability and safety at a highly competitive price point. In addition we aim to continue Timoney’s tradition of encouraging independence and local economic development by offering our customers options for local assembly and technology transfer”. Timoney’s unique solution is underpinned by its heritage as the originators of heavy Independent Suspension for special vehicles with over 50 years’ experience in the field. The offering can also be integrated with Timoney’s range of product enhancements and accompanying systems such as Steering Solutions, Transfer Cases and controllable Suspension Struts and is backed up by Timoney’s array of expert services including assembly training, integration engineering, chassis design and vehicle engineering consultancy. With a number of customer programmes in development it is expected that initial systems will be fielded on vehicles towards the end of 2019.